Twitter COO: We'll Have An Advertising Business Soon. And You're Going To Love It. 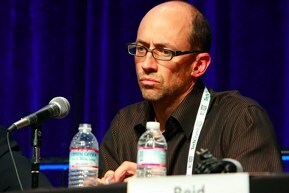 Costolo didn’t divulge many more details, though he did mention that it wouldn’t be tied into the site’s retweet feature. When TC editor Michael Arrington tried to clarify by asking if the ads would be integrated into the Tweet stream, Costolo said that “he didn’t say the ads would be mixed in with tweets”. But he didn’t say they wouldn’t, either.